Litigation finance, a term that didn’t resonate with most of us five years ago, now signifies a rapidly growing way that legal bills are getting paid. 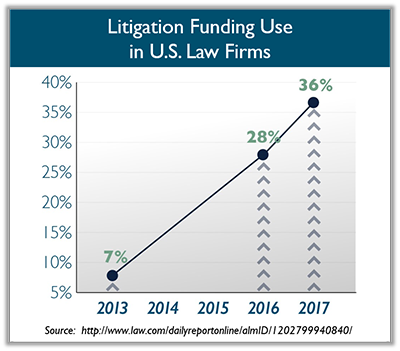 Industry watchers are examining the potential of the funding instrument to change the way litigation happens, support the growth of innovative firms, and enrich investors. Also being tracked are the risks to the emerging practice. Litigation finance refers to third parties providing funds up front to help plaintiffs litigate cases they might otherwise not afford. If the plaintiff prevails, the funder gets a return. If not, the funder absorbs the loss. Understood in these arrangements is that the funder doesn’t actively participate in the litigation or directly influence strategy, including settlement decisions. It’s a way for investors to make money, plaintiffs to access justice, and risk to be shared. Litigation financing is gathering momentum. Thirty-six percent of U.S. law firms used litigation finance in 2017 compared to 28 percent a year ago and just 7 percent in 2013, according to Daily Report. Investors with global reach are boasting of litigation funds topping $1 billion. “…[W]hile some may still view litigation finance as a novelty, the statistics reflect that it is gaining widespread acceptance, particularly as reputable companies continue to enter the market,” write J. Randolph Evans and Shari L. Klevens. They note that defendants may try to reveal the existence and probe the terms of third-party funding arrangements in the discovery process. A super-simple example of litigation finance? Peter Thiel’s funding of Hulk Hogan’s suit against Gawker pretty much fits the bill. Litigation finance executive and former trial attorney Ralph Sutton sorts funding companies into two types – those run by trial lawyers and those by financiers. “The companies run by trial lawyers will be seen to focus on creating value for law firms and their clients, chiefly through single-case and portfolio funding of large and smaller matters,” he writes. The biggest law firms will use funding for portfolios of litigation, not just single cases. Funding will spawn new firms, providing “equity” for innovative startups that share more risk with clients. Two areas to watch: champetry and disclosure. Champetry, an old common law doctrine prohibiting third-party legal funding, is still the law in some states. “However, such provisions are rarely invoked to invalidate litigation finance contracts, and courts addressing the issue have often limited the prohibition against champerty as applied to modern litigation funding agreements,” write Evans and Klevens. The other area to watch is whether plaintiffs will be forced to disclose litigation financing arrangements in discovery. Federal cases are breaking both ways, write Nathan Friedland, Elizabeth Vandesteeg and Jeffrey Goldberg in Law Journal Newsletters. Litigation finance is a new and still emerging practice that could dramatically change the face of law. It will be a golden opportunity for some plaintiffs, a threat to some defendants, and a potential rising tide that could create more work for litigators. One thing is certain: the full meaning of the once-foreign term will soon become clear.